Some may say a legacy is a tradition that like an heirloom never loses its value. Bingo Legacy is such traditions that like your ancestors before you continue to bring excitement to players that never lose its luster. With new and old fashion ways to play Bingo the legacy lives on with a click of your finger and a blink of your eye, you’re there. Straight to the point the landing page proudly displays its showcase of bingo and top games. The layout is simple yet has a fresh and easy on your eyes touch with hues that reflect regal colors of deep purple and gold. The registration is quick and easy and in a matter of a few moments players are on their journey to exciting Bingo, Slots and Casino games. 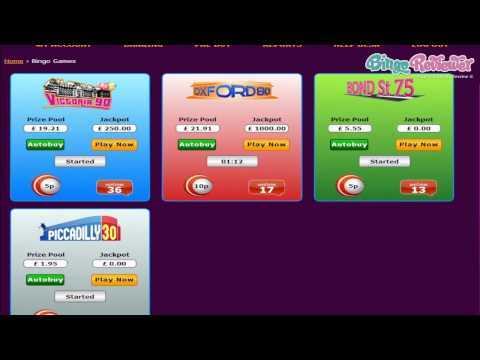 Cozy Games software powers an impressive line-up of bingo products that lead the way in the online industry. All transactions are secured including credit card details that use sophisticated technology through encryption including AVS in prevention of fraud. Bingo Legacy is licensed and regulated by the Isle of Man. Truly a legend in their own time the site offers something that many other online or brick and mortar halls for that don’t have; 4 bingo choices. That is a paradise of options for the bingo community that doesn’t stop at 90 ball or even 75 ball but goes beyond with 80 and 30 ball bingo too. Chat Games offering loads of interactive play amongst roomies with Bingo Bucks awarded to the winners. There is not a large selection of Slots but there are enough to keep a spinner quite content with Progressive Jackpots, Bonus Games, Free Spins and more. Top favorites made popular by those who know best; the player, include The Lost Treasure, Arabian Nights and the British themed Big Ben 2. Video Poker, Table Games and Scratch Cards complete the platform of games to choose from. Players are more than pleased with a Free Play offer to try out the site without spending a penny of their own money. It doesn’t get much better than that. Impressed after your Free play a lucrative Welcome Bonus is awarded to your first three deposits. The generosity doesn’t end there because from your fourth deposit on a Re-Load Bonus is gifted on every transaction. There is standard promotional offers that you can rely on a regular basis along with new and creative exclusives you can expect on a monthly basis. Happy Hour happens three times a week and will boost your playing power with every deposit made during the hours of 5pm – 8pm. Look for special offers that run from time to time with Cash-back on Slots, Prizes and special Bonuses. A smorgasbord of Bingo options makes this site worthwhile. Players can earn Loyalty Points every time they wager that are converted to cash and placed in your account. As far as loyalty it is about as good as it gets considering the VIP program has terms that are difficult to obtain and keep. The max payout per week is $300 with exception of Jackpots that are paid in $1,000 weekly increments. We rate Bingo Legacy with 2 Pink Hearts. I found signing up to bingo legacy to be extremely easy and speedy. In addition to that, you can’t go wrong with the nice little welcome bonus they offer you. It consists of £15 free and gives you a nice chunk of cash to start of playing your games with, without having to use any of your own money. They have a nice selection of bingo to choose from. They give three options, which includes 75, 80 and 90 ball. In addition to the bingo, they offer a nice spread of other games as well. You can choose from plenty of slots, casino games and even scratch cards. I’m not a huge fan of scratch cards, but I will play them every once in a while. When I am not playing bingo, however, I prefer mostly slots and other casino games. Treasure of Egypt is always one of my favorite slots to play wherever I go. I initially joined this site, not only because it was new to the scene, but because of its great opening offer of £15. This is the gift they give you upon signing up as well as a number of other deposit bonuses, including a 750% bonus on your first three deposits. I really like the layout they have here. It’s colorful and it really looks like a new, fresh site that anyone would want to play at. They have plenty of promotions up for grabs at any given moment. One of my favorites is the happy hour bonus promotion which takes place every Monday, Tuesday and Wednesday. They take place from 4pm-6pm and you’re given the opportunity to reap a 125% bonus on all deposits of £20. They have four types of bingo available here, which includes 30, 75, 80 and 90 ball. You can’t really ask for more when it comes to a selection of bingo. This site was new for me, and I am glad I stumbled upon it. Not only for the nice No Deposit Bonus (new players get a £15 bonus just for signing up), but also a cumulative first 3 deposit bonus of massive 750%. After that, there's a reload bonus up to 250%. So, I would call this a rather good deal for all new players. One of the Cozy games sites, and I was really impressed by the offer. If you are a bingo fanatic, you will be happy to see the offer: they have the regular 75 and 90 ball games, but also 80 and 30 ball games you won't find everywhere. The tickets start from 5p, and the only thing I don't like is the fact that you have only 4 rooms in total. In addition, you will find also more than a few slots, so you can combine and play whatever you like. They have some really cool promotions here that are impossible to pass up! First off, they start new players off with a free cash bonus which you can’t go wrong with. One of my favorites at the moment is their Strictly Slots Giveaway, which is not one of their ongoing promotions but it is certainly a blast! If you’re a big fan of slots, you are sure to love this deal. You’ll get to spin for your share of £5,000. It’s really simple. All you have to do is play your favorite slots like normal, and after a certain amount of time, they announce the top two players for a chance to win the massive cash prize! You can also win plenty of extra goodies by engaging in any of their chat games which are always entertaining. Plus, there are ample opportunities to collect loyalty points while playing at the site.